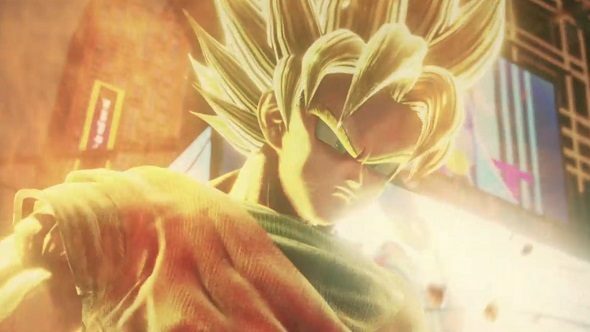 One of the (actually, many) surprises in Microsoft’s E3 2018 presentation was Jump Force, which looks like another big crossover game based on manga publisher Shonen Jump’s back catalogue. That means Dragonball, Naruto, One Piece, and Death Note. Highlights from the trailer include Goku turning Super Saiyan, Naruto doing his iconic run across a skyscraper, and Luffy from One Piece putting in an appearance. As one of our readers points out, Thousand Sunny, the Straw Hat pirates’ ship from One Piece, also shows up at the beginning. According to a press release, Jump Force will be another fighting game, like most of the previous Shonen Jump crossover games. You’ll create a three-character tag team and take them into battle in arena brawls set against famous global landmarks, such as New York’s Times Square and the Matterhorn mountain. Plenty of exciting announcements have already been made at E3 2018. To further stoke your personal hype train, check out our list of upcoming PC games. Jump Force will be made in Unreal Engine 4 and come to PC via Steam in 2019. “Jump Force gives fans of manga and anime a dream opportunity to see their favorite heroes come to life in our world in a globetrotting adventure filled with explosive battles of epic proportions,” says Eric Hartness of Bandai Namco. It sounds like a fairly standard crossover premise – Shonen Jump’s many fictional worlds are colliding, with their villains representing some form of threat, and their good guys uniting as one to save the rest of us.